Recently, I came across the Andy Warhol quote “They say time changes things but you actually have to change them yourself”. Boy, that Andy sure knew what he was talking about! Don’t get me wrong. I know time changes things and there is absolutely nothing we can do to stop it. Every morning in the bathroom mirror, that point is reiterated to me by fine lines developing around the corners of my eye, tiny creases popping up around my lips and little witches hairs growing from my chin. Shamefully, I admit I’ve now lived long enough to grow chin hair and one day will be too blind to pluck it myself. If you don’t have chin hair yet, ladies, just wait. You will. Nature will take its course even on the best of us. No matter how much synthetic snake venom infused über expensive eye cream I use, and I cake that crap on, eventually, I will have full-blown crow’s-feet. Time and gravity at some point will cause things to shift so far south that no amount of money or help from the world’s best plastic surgeons will be able to pull that mess up where it was pre-shift. Depressed yet? Don’t be. I started with the bad news, news you already knew unless you are completely delusional and think that your $150 a jar night cream will stop the effects of time indefinitely. Good news is that while time changes a lot of things, it doesn’t change all things. If we don’t put forth effort in certain areas, even time won’t change us but if we are willing to work on ourselves, we can change for the better. It may not be easy but it is doable. I know from experience. Sometimes, I forget this because it feels like I’m a jacked up truck mired down in a mud bog spinning my all terrain tires. To remind myself, I compared a picture from Halloween 2010 to Halloween just a few days ago. Goodness gracious, I couldn’t believe the change I saw. 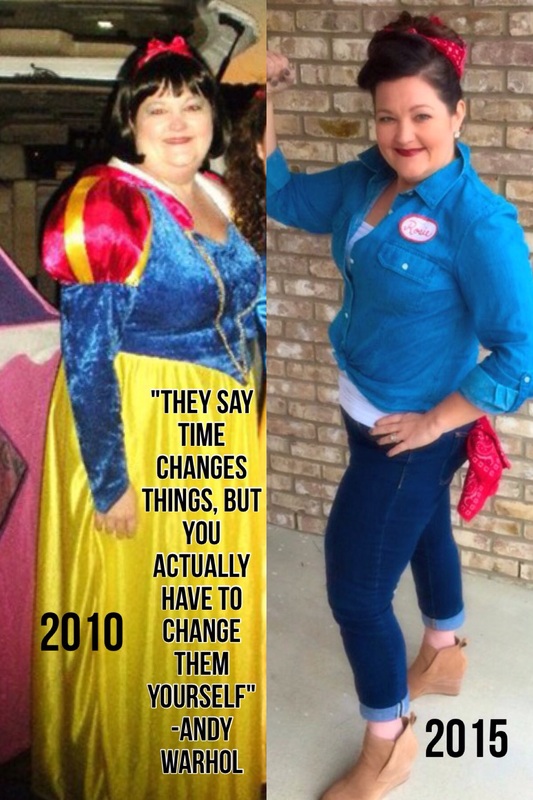 I had lost 75 pounds in that time period but more than that, I had changed the way I viewed food, diet and exercise. I had changed my mind, me. That change didn’t come just because time passed. That change came because I did the work making gradual changes over the past five years that added up to a really big difference. Little by little, the changes that seemed excruciatingly hard to make in the beginning became second nature. First thing, I cut out Cokes. I’m from the South. Coke includes, Sprite, Dr. Pepper, Pepsi, really anything that fizzes when you pour it. Next, I cut out fast food. Don’t get me wrong, I still love McDonald’s fries and Sonic’s Onion Rings and will indulge in their deep-fried goodness on occasion just not every day. After removing several unhealthy habits, I began to add healthier stuff, exercise to my daily routine like spin and circuit training and hippie granola stuff to my diet like chia seeds and super greens. When I added chia seeds to my list of pantry staples and started making the occasional trip to Whole Foods, my mother was afraid I had turned into a flower child and would soon quit shaving my armpits. No fear of that, I don’t want to be mistaken for a Sasquatch even if it is No Shave November. Moral of the story: I changed myself. Time didn’t have a darn thing to do with it. Ephesians 4:23-24 Be renewed in the spirit of your minds, and to put on the new self, created after the likeness of God in true righteousness and holiness.